1. This ZP45 rotary tablet press is a double-press machine. Through ZP compliant dies, granular materials will be pressed into tablets with double sided ejection in circular and other irregular shapes. 2. It adopts precompression roll and main compression roll for achieving quality tablets. 3. Forced feeder is applied and it is easy for mounting and dismounting. 4. Under the control of PLC with touch screen, this product offer digital display of speed of rotating turret, real-time pressure of every set of working dies, impeller speed of forced feeder, product name, batch number, production time and other working parameters. Moreover, the rotary tablet press allows setting the pressure of system, average pressure of working dies, filling depth, tablet thickness of precompression and main compression and production capacity through the screen. Due to the USB port mounted, this machine is capable of collecting the data related to working status. Information regarding the emergency shutdown, overload of motor, overvoltage of system and other breakdowns will be displayed and recorded. Through USB flash disc, real-time data can be read and printed every ten minutes. 5. The overload protector will force the machine to stop automatically against overlarge pressure. 6. 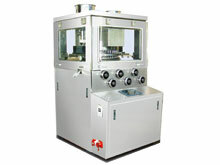 Our rotary tablet press also offers protection while assembling and disassembling dies, ensuring the operating safety. 7. Aside from the totally closed stainless steel housing, all parts in contact with the medicine are made of stainless steel or well treated on surface, and they are nontoxic and corrosion resistant. 8. Special surface treatment is implemented on the turret to avoid cross contamination. 9. The pressing chamber is structured with transparent organic glasses all around, which can be opened totally for easy cleaning and maintenance. Most of the existing middle speed tablet presses are scaled up proportionally based on 35D machines. Therefore, problems like low precision of tablet ejection and large vibration appear inescapably. This ZP45 rotary tablet press is a new developed machine in 2006, featuring reasonable structure, outstanding rigidity, high pressure and precision, ease of operation and other strong points. 1.With four-pole frame, the pressing chamber is spacious, bright and easy for cleaning. Its upper and middle plates are very solid. 2. Our machine is outfitted with worldwide famous worm and gear, threaded inset and internally mounted pressure sensor for adjusting pressure with precise and flexible control. 3. Upper bilateral rail for punches is capable of distributing stress evenly so as to reduce abrasion. Additionally, this rotary tablet press has gained great praise from customers at home and abroad due to high efficiency, stability and reliability. We provide pharmaceutical tablet press with different models with maximum production capacity ranging from 14,400pcs/h to 205,000pcs/h. As a reliable pharmaceutical machinery manufacturer, FEIYUN also offers capsule filling machine, capsule polisher, medicine pack blister packaging machine, medical high purity nitrogen generator, automatic tube filling and sealing machine, etc. If you are looking for pharmaceutical equipment in line with cGMP standards, please contact us and we have what you need.